Last week, I turned to Molly and said, "how would you like to visit a waterpark?" She said "yeah, as long as it can be one that's like Typhoon Lagoon." 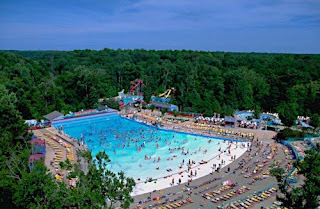 So, I went to waterparks.com and started to check out all of the different parks that are within a two hour drive of Washington, DC. Finally, we settled on a day at Water Country USA.... which I thought was the closest thing to Disney we have. Since it's owned by Anheuser-Busch (for now), we knew it would be a quality experience. I've always been a bit of a "pudgy" fellow, so waterparks were never my thing. But since I lost some weight over the past year, I decided to give it a shot. But sorry folks, if you're looking for shots of me with my shirt off, you're out of luck. You'll have to go someplace else for that kind of action. Anyway, we were really impressed by what we saw! The park is surrounded by the same type of landscaping that you find at Busch Gardens Europe. Instead of simply plopping down waterslides on concrete slabs, they managed to surround the various attractions with trees, flowerbeds and very effective 50's and 60's theming. No matter where you went in the park, you heard the sounds of The Beach Boys, Elvis, Buddy Holly and other recording stars of the era. Most of the attractions at Water Country USA were aimed at a family audience. There really weren't any intense attractions that would cause someone to think twice. For me, one of the scariest waterslides anywhere is the BombBay at Wet and Wild in Orlando! But there wasn't anything as crazy as that there. Meltdown - a high-speed, three person toboggan ride full of turns and banks. Big Daddy Falls - a 670-foot family raft ride with a series of twists and turns and two splashdown pools. AquaZoid, a white water raft adventure that happens mostly in complete darkness. To make this ride more exciting, there are waterfalls and lighting effects. New for 2008 is Rock and Roll Island. The highlight of this interactive area is the Jammin' Juke Box, a series of three body slides named after different dances from the 50's. The highlight for us was the Hubba Hubba Highway. It's an interactive lazy river that's about 1,500 feet in length and covers 3.5 acres. It's themed like a drive down Route 66 and it's full of interactive features such as waterfalls, sprinklers, cannons and even a palm trees with coconuts that spill water on riders. The best part is that it moves a little faster than the average lazy river. Also, instead of having huge tubs clogging up the river, guests are encouraged to float along with life preservers. That seemed to make the river flow a lot faster. There were also several interactive play areas for little kids, a pretty large (and crowded) wave pool and a really well produced diving show. We went on a sunny Sunday in August. So the lines for the popular slides was anywhere from 30-45 minutes. But the majority of the wait was in the shade, so it wasn't too bad. The prices weren't too high. The admission was $40 per person with a $10 per car parking fee. (However, if you buy your parking ticket online they knock off a dollar.) The food prices were a little high for my tastes, but we managed to get out of there without breaking the bank. The locker charge was $10 for a small locker, but they give you $3 back in the form of a coupon to buy food or merchandise. Sadly, this must be a growing trend. I'd appreciate the three bucks back in good 'ole cash, because the only thing we found for less than $3 was a bottle of water. But with tax it came out to $3.04... which meant we had to go digging through Molly's purse for 4 cents. All in all, we had a great time and would definitely come back! Talk about this trip report in the CoasterRadio.com forums. Three Cheers for Universal Orlando! Holiday World Sets a Record in 2009! "This one time...at band camp...."
Do you have $50K to spare? What's next, paying to pee?